I was dreaming in Lebanon, Missouri when thunder and rain awoke me, confirming that my plan to hike at Lake of the Ozarks was ill-timed. The updated forecast had told me I was in trouble, so I had already booked a ticket aboard the Titanic museum in Branson for the afternoon and planned to visit the Springfield Art Museum in the morning. I waffled out of the continental breakfast at the Super 8 and drove to what was once the Country Kitchen but has been renamed the Elm Street Cafe. The hot breakfast was welcome amidst the rain and I overheard a nearby couple remarking on my iPad 2, which I was using to read the digital edition of the Tulsa World. But their discussion brought out that they’d already seen a unit, so I did not offer to let them play with it. I drove an hour southeast to Springfield, arriving about 15 minutes before the Art Museum would open. It is on the edge of Phelps Grove, a park which was once the home of Missouri governor John Phelps and at one time sported a lake and zoo. The primary features today are a pavilion and small rose garden. I wandered amidst flowers which had passed their peak, shooting red roses, a crying rose, an iris or two, a reminder of clematis, and a final red and white rose. It was a good thing I took plenty of flower pictures to remember my visit, because the art museum did not allow cameras and there was frankly little art there I would wish to remember. The main exhibit of Philip Pearlstein’s scrawny nudes did not appeal to me, although he has at least some work I like. But I did enjoy many of the watercolors on display and sale, particularly Rachel Collins’ Horn in F II. I had time to kill, so I drove over to L.E. Meador Park at Battlefield Mall to sit and read until the mall opened. The park is named for Dr. Lewis Elbern Meador, my third cousin twice removed, who wrote most of Missouri’s 1947 state constitution and helped end the Pendergast machine’s control of the state judiciary. He was the head of political science at Drury University and was instrumental in establishing the Wilson’s Creek National Battlefield. Once the mall opened I went into J.C. Penney to update my school wardrobe, coming out with eight new pairs of slacks, four shirts, and two belts, none of which I’ll get to wear until August. I had lunch at the nearby Applebee’s and then drove south to Branson. To ensure I’d arrive at the designated departure time for the Titanic, and departure would have a double meaning for me later, I deliberately drove down the congested strip, passing the fun waxworks where Kong was fighting a biplane and found the Titanic plowing through the ocean and scraping the iceberg. The museum was interesting, although I’ve been fascinated by the ship since childhood so I learned little that was new to me. It was fun to ascend the grand stairway and I enjoyed the large models of the ship, including the one of the wreck used in Cameron’s movie. I saw far more objects from the wreck itself at an exhibit in Oklahoma City some years back. I was assigned the role of Oscar Scott Woody, who was a mail clerk who departed this world in the accident on his birthday at 44 years of age. I’m 44 myself, so I felt for poor Oscar. The sun was bright and hot and the forecast for the area said the chance for rain was now quite reduced. So I searched my Hiking Missouri book for a nearby trail and drove an hour east to the Hercules Glades Wilderness. 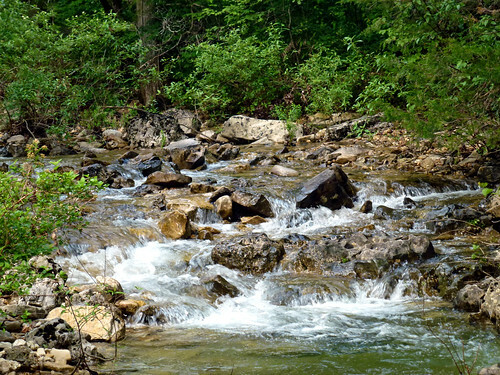 It is the second largest in the state and preserves the occasional open grassland, forested knobs, steep rocky hillsides, limestone outcroppings, narrow drainage maze, and hollows that once characterized this part of the Ozarks before the big lakes were constructed. Parking at the fire tower, a duplicate of the ones at Sugar Camp and elsewhere, I changed into a wicking shirt and light trail pants and doused myself with Cutter. There was a line of cars and some horse trailers at the camp, so I figured I’d see some other hikers and perhaps some trail riders out on the trail. Sadly, the fire towers are no longer maintained. When visiting the Piney Creek Wilderness last October I had to walk up a flight of stair supports to gain access and here they had surrounded the tower with a high fence topped by razor wire. So I could not get the promised great view of the surrounding wilderness. I headed out on a trail and soon several riders passed, who commented on how maps seemed useless in the wilderness without a compass, and then I came upon a couple who asked about the trail. I confessed I was new to it as well, but shared my trail map and, having spied them taking photos of one another as I approached, pleased them with the offer of taking their photo. We decided what trail we might be on and then I marched ahead, propelled by my trekking poles. The trail offered plenty of shade from the hot afternoon and I quickly reached the first junction. I realized we were on a different trail than we’d thought, so I lingered and when the couple I met earlier arrived I showed them the path they should take for the shortest loop of 4.5 miles. They posed for another picture at the junction and we parted. I was opting to hike on toward Pilot Knob for a longer loop of 6.8 miles. The trail had been wide and rocky but now narrowed, occasionally broadening out into one of the eponymous glades, where butterflies dined on white flowers. Some glades provided glimpses of the nearby ridges. I turned at the next junction toward Long Creek, which flows from the tower area clear across the wilderness. The creek was swollen and running well. It had scooped out a limestone bank and there was heavily eroded limestone at the ford. I admired the small waterfall and I made a movie of the water tumbling across the rocky limestone creek bed and took a close-up of the flow. That first ford was the highlight of the hike, but I would ford the creek several times on my return to the trailhead. While my new waterproof boots served me well traipsing about the first ford, a couple of later ones had no rocks sticking up out of the high flow and I had to drown my boots and socks. Thankfully the water was far warmer than the 28 degree Fahrenheit ocean when the Titanic sank in the frigid North Atlantic. Later fords had limestone outcrops and more small falls which provided a picturesque break from the forest as the trail paralleled the creek before heading uphill towards the fire tower. I snapped a millipede in motion and myself and a daisy at rest and arrived back at the camp for a much-needed clean up and change of clothes. I stopped at Prima’s in Ozarka for some fajitas and arrived back at home just before midnight with two days left in Memorial Day weekend for a visit to the lake with friends.